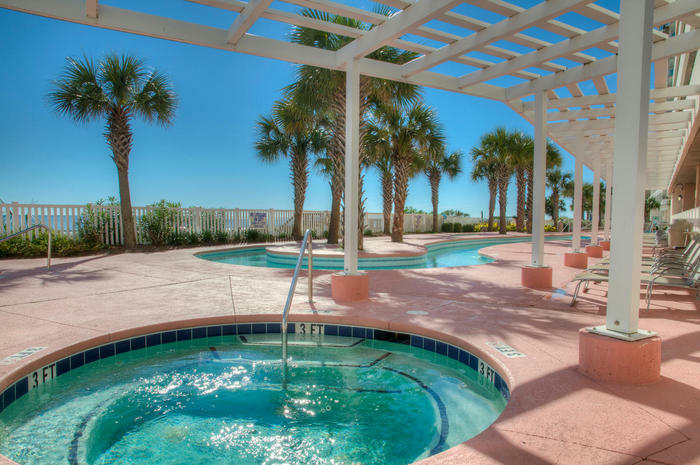 This beautiful North Myrtle Beach condominium complex is in the Crescent Beach section of North Myrtle Beach, South Carolina, between 18th and 20th Avenues South. This North Myrtle Beach resort is one building in which the parking garage is on the first couple of levels and the North Myrtle Beach vacation rentals are built above that. So you can park and be in your fabulous North Myrtle Beach condominium rental in no time. The accommodations at Crescent Keyes are fantastic and the amenities are exactly what you hoped to have during your North Myrtle Beach vacation. Palm trees landscape much of the inviting grounds at this modern North Myrtle Beach resort. Swaying in the sea breezes, the palm trees comprise a quintessential part of your beach vacation. A quaint wooden boardwalk leads from the oceanfront swimming pool area to the white sandy beaches and the crashing surf of the Atlantic Ocean. Cross the dune line where sea oats blow in the gentle wind that is usually present on the beachfront. What a serene setting at Crescent Keyes North Myrtle Beach resort. Start and end each North Myrtle Beach vacation at Crescent Keyes with these awe-inspiring views of the pool deck and the sea. The innovative design of the oceanfront sun deck at Crescent Keyes is unique because this pool deck is partially covered by the North Myrtle Beach resort. Sun shines brightly on the sun deck, but finding a shady spot is easy, too, when you prefer to take a break in the shade. The oceanfront swimming pool has a cool feature. It is built around two pillars that kind of divide the pool into three sections. Just behind this big pool is the kiddie pool. It is only one-foot deep so the toddlers in your family have a safe place to play. Everyone will want to lounge by the pool in the comfortable chaise lounge chairs that line the sun deck. Bring that book you have wanted to read but haven’t had the time and start reading while you get a suntan. With such delightful views as you have from the oceanfront sun deck at Crescent Keyes it is easy to spend the whole day poolside. You will be just a couple floors away from your North Myrtle Beach vacation rental so when you need a cold drink or want some lunch, you can easily retreat to your condominium and the fully furnished kitchen there. Elliott Beach Rentals is not affiliated with onsite management or the HOA of Crescent Keyes.